Based on traditional techniques with a modern twist, the floating planets are a new and different way to grow and display plants. Planteplaneter are small handmade design “planets” of soil with succulents growing out of them. They are made to hang from windows, ceilings, furniture etc. The design of the Planteplaneter is based on traditional Japanese techniques, with an added modern twist. 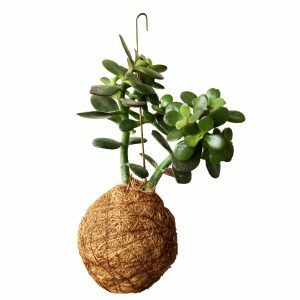 Therefore it is a poetic and decorative suspension system, that offers an alternative to the ordinary houseplant. By presenting the plants as little flying planets, they notably become magical hanging sculptural mobiles. Succulents and cacti prefer places with natural light, in particular places such as windowsills. The Planteplanet is easy to water. You do it by dipping it in a bowl for ten minutes every two weeks or so. However on hot summer days it must be watered every week. To sum up, If you squeeze the Planteplanet after watering, it can be hung directly back into position without dripping. Every Planteplanet comes with one built-in hook. 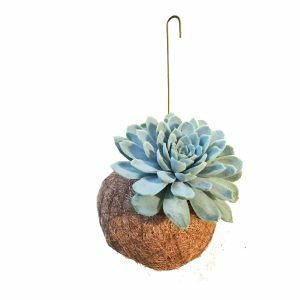 If you desire other ways to display your Planteplanets, check out our brass mobile “Halo” or our other accessories after browsing our store.